Once this single image is uploaded, YouTube will resize and crop it to serve different sections to different mediums. 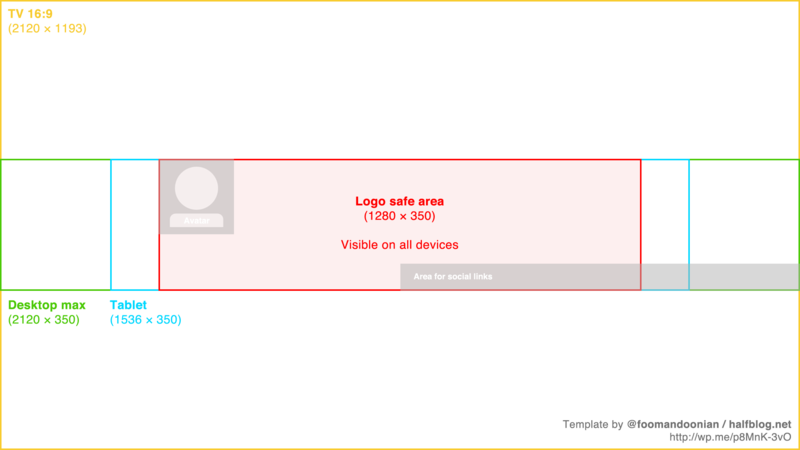 The central 1280 × 350 area will appear on all devices, though the top-left and bottom-right may be partially obscured by a channel avatar and external social media links. The entire 16:9 image will be displayed when the channel is seen on a TV display. Updated 2013.03.11 to tweak the post title and insert a handy link. This entry was posted in Design, Social media and tagged YouTube by Geoff. Bookmark the permalink. Thanks for the helpful template Geoff, exactly what I was looking for. Cheers! Also feel that it brings us back to a G+ / FB layout without much possibilities. And quite frankly since I am not a designer I had some tough time uploading an image with a good size (always to small or too heavy ^^). Thanks for your nice comment Erika. I agree that the new channel designs don’t leave so much room for branding and self-expression. Great template and video. Thanks. The full-size image is the download. There’s nothing else to it.